Want an easy way to plan your group’s outing to historic Raue Center For The Arts? Look no further. 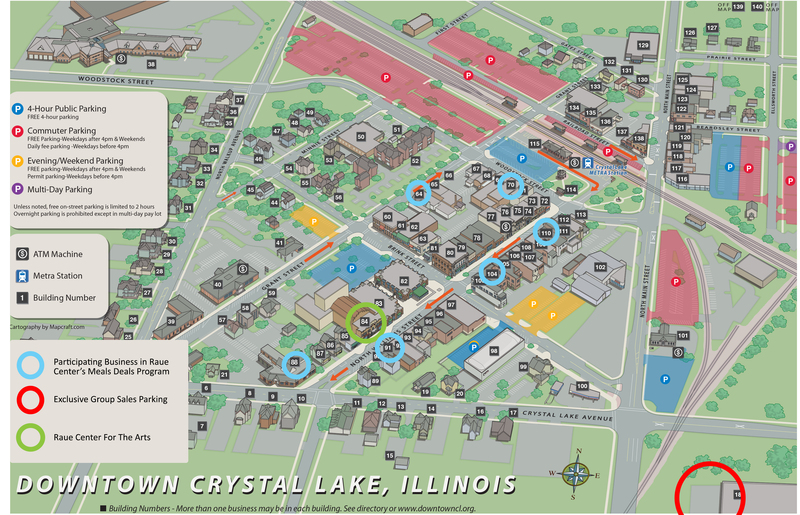 Below you will find a downloadable travel guide complete with restaurants, shopping and parking. You also information on lodging, access to our exclusive members lounge and souvenir gifts and photography can be found below. Click Here for a downloadable version of this travel guide. Raue Center is working with select downtown restaurants to provide you with discounted meals for the best experience possible for you and your group. The participating restaurants are listed below are also marked on the above map (also downloadable here). Exclusive Parking for groups is available at 100 S. Main St. (#18 in map above) with optional shuttle service from from the parking lot to the theater. If you wish to opt for not using our exclusive parking service there is an abundance of parking all around and near the theater as well as throughout the downtown area. If your group is arriving by the train the Crystal Lake stop of the Metra’s Union Pacific Northwest Line is located less than two blocks from the theater. Please check the Metra website for the most up to date Metra schedules. Below are listed nearby places you and your group might consider to stay at while you plan your visit. Please let us know in advance if you and your group wish to have access to our upstairs membership lounge. We create temporary passes for you and your group’s access to the bar that will be available for pick up at the Box Office with your group’s tickets, as well as any comp tickets or drink tickets your group has earned through our Rewards Program.